St. Cloud Window is a presenter at Window Jam 3.0: A Continuing Education Session. The 3.0 credit session focused on fenestration field testing, aluminum commercial window basics, and window wellness. SPEAKERS: St. Cloud Window Rep – Alan Peterson, Owner, AE Peterson & Associates and Kelly Kassab, Architectural Products & Services at A.W. 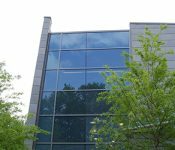 Hastings & Co.
Fenestration Field Testing – This presentation provides technical information about field testing of installed wood and fiberglass windows for air and water infiltration. The course covers field testing requirements, documents and specifications, procedures and results. 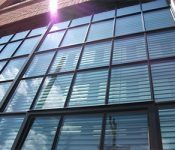 Aluminum Commercial Window – The Basics and Beyond – Focus will be on historical, acoustical use for both interior and exterior use, and hurricane/blast windows and doors, as well as an in-depth understanding on how these products relate to different glass types and conditions, and how material costs will be impacted by the more sophisticated performance levels. 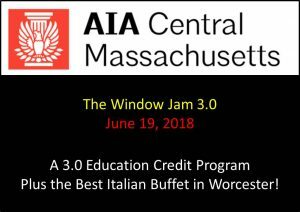 TO REGISTER go to AIA Central Massachusettes website. St. Cloud Window is a committed provider of AIA accredited continuing education programs for architects and design professionals.